MOLINE, IL - Kelly and Tammy Rundle of Fourth Wall Films have won a $15,000 Humanities grant award for their historical documentary film project Country School: One Room - One Nation. The grant will fund a portion of costs associated with on-camera interviews of one-room school scholars, former students, teachers, and filming at a variety of historic country school building sites in Iowa. At their numerical peak in the early 1900s, Iowa had more country schools than any other state in the nation. Iowa still has the most, with 3,000 existing school buildings and 200 fully restored country school museums. Over 50 one-room schools are still operating in Iowa. Humanities Iowa has previously supported the Rundles' Lost Nation: The Ioway (2007) and Villisca: Living with a Mystery (2004). 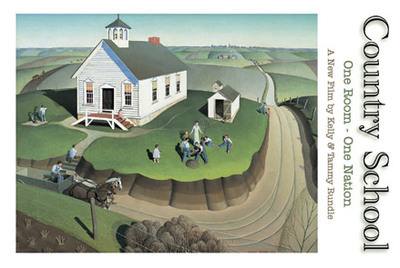 Fourth Wall Films in Moline, Illinois is pleased to announce a new historical documentary film project tentatively titled Country School: One Room - One Nation. Country schools took rough-hewn pioneers and multilingual immigrants and transformed them into a literate and patriotic new nation. Whether personally, or through a parent or grandparent, the country school as an American architectural icon, is as imprinted on our perception of the nation’s early history as the log cabin and the general store. From the first schools in new states to the demise of their widespread use in the 1950s and 1960s, Country School: One Room - One Nation tells the dramatic true story of Midwestern country schools and their impact yesterday and today. Production will take place in several Midwestern states including Iowa, Illinois, Wisconsin, Minnesota, South Dakota, Nebraska, Kansas, and Missouri. We need your help to bring Country School: One Room - One Nation to the screen. Your generous contributions will be acknowledged in the finished film's onscreen credits and on the web. Thank you for your support for this important historical documentary film. Grant Wood, Arbor Day, 1932, Oil on Masonite panel, 24 x 30in. William Koch Collection. Courtesy the Cedar Rapids School District.